As expiration approaches, the delta of in-the-money options approaches one, while the delta of out-of-the-money options approaches zero. Known also as “charm,” delta decay is a second-order Greek that measures the rate of change of delta per day. And that makes sense; the closer an option gets to expiration, the more binary it becomes. 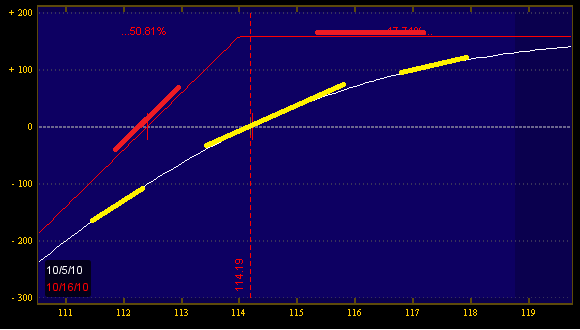 And if you're buying out of the money puts as hedges, the closer they get to expiration, the less hedginess you'll get. And we can see that reflected in this chart: the current gamma of the sold put is around -9, but when we get to opex, we have a discontinuous change between 0 and 100-- this creates what's known in engineering circles as a "dirac function"-- essentially a giant spike. 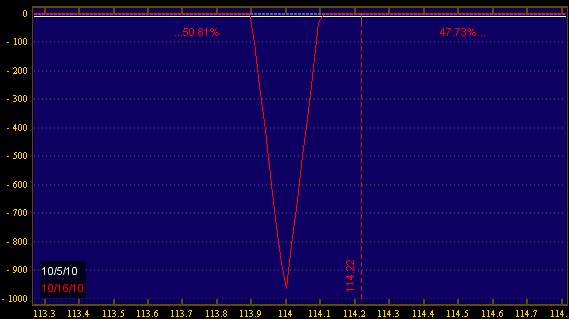 So we know that for sold options, gamma increases in magnitude over time. This is known as color. If you are selling puts with 5 weeks left, you will have less overall "heartburn" than if you sell puts with 5 days left. The tradeoff is less theta, but that's for another post.